← Inspiration: Viola Davis is Stunning!! Tuesday night I went to the CapFabb monthly meetup at Madewell in Georgetown. For those of you who do not know what CapFABB is, it stands for Capital Area Fashion & Beauty Blogger which is a group that I recently joined. I got lots of compliments on my outfit at work since I dressed up for the occasion (can’t go meet a bunch of fashion bloggers and not bring your A game). In fact, after lunch one of my coworkers nicknamed me Sharice from MOS DEF – Ms. Fat Booty (Uncensored) – YouTube because a guy at the cafeteria apparently stopped in his tracks with his mouth open but that’s for a whole different blog post lol. I arrived right at the start and there were a few people milling around and browsing. Since this was my first meetup I wasn’t totally sure what to expect but when I got upstairs and saw the champagne, blue bottles of Saratoga sparkling water and even better CUPCAKES(!!!) I knew these were my kind of women. As people continued to arrive, I did some browsing and found some AMAZING blue pants on sale which I bought (I’m wearing them today actually… picture to come soon!). I went back and was able to do some mingling but unfortunately had double booked that night so I had to run early but I am soo glad I went both for the pants and the other women that I met there. It got me excited to get back to blogging and to continue to branch out and see where this can all go! Can’t wait for the next one so I can really mingle and meet all the lovely ladies. It should be a big one too since it’s going to be their one year anniversary!!! 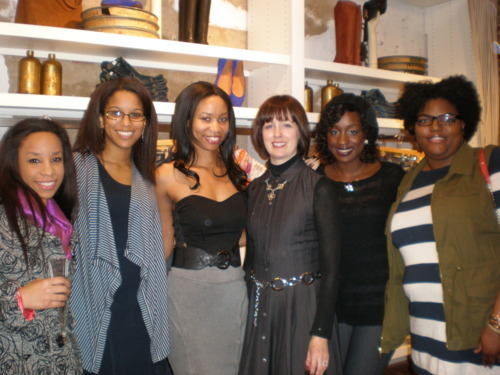 About CapFABB: The Capital Area Fashion & Beauty Bloggers (CapFABB) organization was founded by Liz Fassbender and Lacey Maffettone as a way for DC area fashion and beauty bloggers to connect, collaborate and organize events in the DC area. With over 200 individual members, CapFABB hosts monthly meet-ups and works to promote local businesses, designers and bloggers. If you are interested in becoming a member of the CapFABB organization, would like more information or would like to work with us, visit our site here.